Got up on Tuesday at 4:45AM take the 2 hour drive to Cannon Beach before the sun came up. I took about 300 shots (lots of bracketing) and this is the best result for the small canvas size. I really went back and forth between this one and another different type of landscape of the beach. I had the other in originally and then changed last minute. Used a Neutral Density filter and a Polarizer for this shot. As a neat aside. I planned this shot from 200 miles away using Google Earth. I found a similar shot on the net and figured out where it was taken from by lining up features (the rocks) on Google Earth. Ain't technology great? Post processing is boring. Typical stuff. POST: Wow! What a challenge. I'm honored to take third in this one. There were at least a dozen pics which deserved ribbon as much as mine. Full props to my wife who convinced me to change to this entry from another I had already entered. It's also pretty wild that I fulfilled all three of my goals on my profile with this shot: 1) a 7+ shot 2) get my average over 6.0 and 3) a second ribbon. Where do I go now? I love this! And, congrats on ribbon! Doc, they should put this challenge back on the front page for a week, so as to let ya celebrate in deserved style ... congrats man! Great picture. I'm curious, why in black and white gallery? It does have a somewhat monotone feel but still colorful too. Nice job. Congrats, Doc... Contrats. Gotta love Google Earth. In answer to your question... where do you go? Same way you�ve been headed... Up. Keep it Up, Doc. 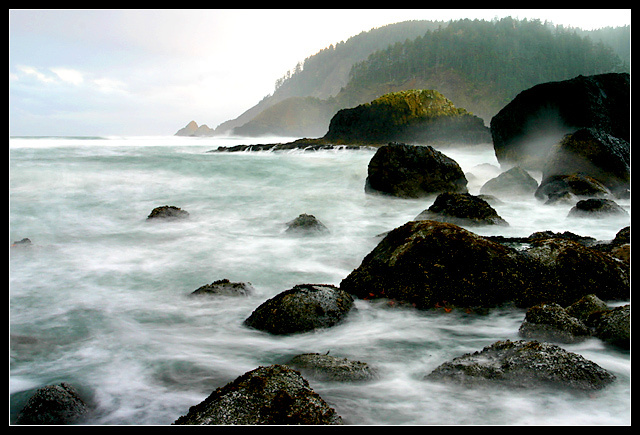 Not to be the odd man out, the picture is awesome, but isnt this really a Seascape, not a landscape? Congratulations, a well deserved ribbon. Jason, this is wonderful...I know the spot exactly! Great job and congrats on the ribbon. Congrats DrAchoo!! An absolute beautiful shot...And as a fellow geek, I love the google earth technique! Marvellous shot. Great capture and a ribbon to the right man... to fulfill his goals! Congratulations. You rock! Congrats. Awesome entry. Congratulations, Jason, way to go (and congrats to your wife for her excellent eye). Wow - Love your explanation! COngrats on a terrific image and another well-deserved ribbon. Way to go! One of my 10s this time around -- excellent shot! WOO-HOOO!!!! Big Fat Way To Go there Doc!!! I've been following your work pretty closely, I'm very glad to see you ribbon on this one!! I love this picture, nice capture. Another ribbon already? I'm not surprised! Congratulations Jason on your ribbon and another great shot. Congrats on your ribbbon..!! Pretty shot! Congratulations. It is good to see someone who brings so much extra to this community, enjoy the fruits of his labor and talents. I recognize those very rocks! Beautiful capture of Indian Beach! Way to go Doc! Killer nice shot, not the usual perspective. Congrats on this great image and achieving 3 of your goals in one hit. Well done. Should be one of the high point captures in your port. Simply breathtaking. Congratulations on your Yellow. Beautiful! Sometimes it's worth getting up early (well, at least for photograhy!). Congratulations! I'm jealous of the beautiful scenery you have in Oregon! Congratulations on your Ribbon! This is Gorgeous!! Nice job, 4 seconds eh.. note to self... Great image awesome! I would change nothing! haha. Great shot. I have shot that exact spot numerous times with my freind zoomdak. We still have dibs on it when we return from college. great work! Way to go Doc. Yer crankin. Congrats! congratulations on a well-deserved ribbon, jason -- very impressive work! Your trophy case is growing. Congratulations on your second ribbon! And with regard to your planning of this shot - cripes, that's just nuts. Something about this really caught my eye. Reminds me of a painting I have. Good job! Very nice. Good creative use of long exposure. Use of ND filter I presume? This one is very good. I likethe comp and presentation very, very much. Exceptional seascape. Your highlighting works very well and the slower shutterspeed (or noise reduction) used for soft focus on the ocean surface is nice. One of my favorates, Like how "foggy" the sea/water is. Sweet flow, contrast and colors! Great lighting, exposure and composition. This is a contender in my opinion. Very nice - great exposure! I like how you were able to capture 'some' color and not overexpose the shot. Nice job. 7 - Nice shot and effects. Criticism; the frame may be a touch too 'heavy' for this scene, in my opinion, not sure. Like the contrasting 'scapes. I like the photo, but the border is really distracting. It might be ok if it were just the black, but the white part really draws your eye away from the photos, perticularly because it stands out on the bottem and fades into the image at the top...makes it seem out of place on the bottom and right. Gorgeous. Adding to my favorites. I love how the slow shutter speed makes the water look like it has mist hanging over it. The contrast between the rough dark rocks and the smooth white water is stunning. Would love to know where this was taken. The only thing that could maybe improve the shot for me would be some burning (not allowed for this challenge) to the sky and hill at the backs. I just say - Magnificent! Nice and soft in the background (perhaps a little bit to light) contrasting with the dark ruff in the foreground. Movement in the sea to the left contrasting with the static elements in the right. Very interesting. One of my top three this week. Just a great capture. I envy you to live in a place where you can have this type of landscape to explore with your photography. Beautiful, I love the water and mist. You've captured the feeling of the ocean, very nice. really really beautiful.. adding to my favorites and giving it a 10... superb! Proudly hosted by Sargasso Networks. Current Server Time: 04/24/2019 12:24:46 AM EDT.